I have been buying some of the ST series 2nd hand, like DS9 seasons 1 & 2 and ST next Gen seasons 1, 2 & 3 and oddly some of these 2nd hand series do arrive still in plastic seals and have never been opened or watched before. I am not complaing when I pay only a fraction of the costs. THE HYPOTHESIS OF THE STOLEN PAINTING (dir. Raul Ruiz). Only the BUNCH was a must-upgrade, but I just felt it was too good of a deal to let slip by, and there was some sense of destiny in that I bought these off Portland Goodwill's website, so these might actually be disks I sorted and scanned and sent in to them from the Tigard, OR store. We'd've actually made more money if they let us keep them and sell them at the store, probably at least four bucks apiece, but I guess they're doing the GW version of the SNL routine about the bank that only makes change. How do you succeed with this? VOLUME! Also got THE HOUR SEASON 2 on blu recently, plus an absurdly cheap SHIP OF FOOLS/LILITH BR double. Haven't ever seen the latter, but I love parts of SHIP dearly. 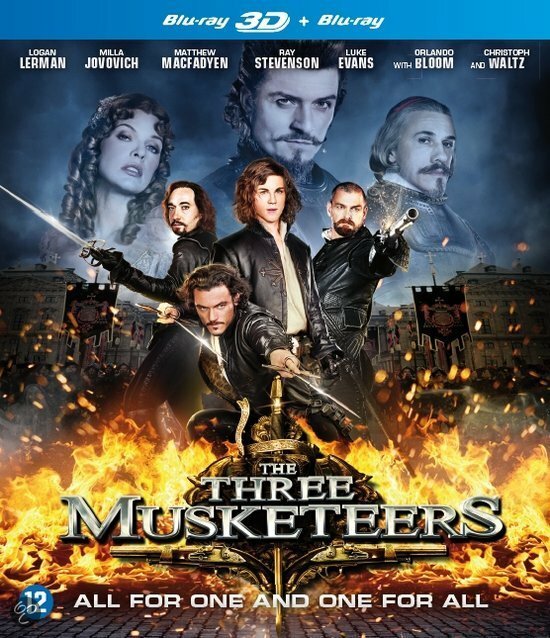 The Three Musketeers 2011' 2 disc 3D edition (3D/2D + DVD) in digipack. Django Unchained, £7 in Sainsburys. At last! Raul Ruiz's NIGHT ACROSS THE STREET. Won the dvd of Oz from Sam Raimi. 2 years a go when i won 2 dvd's i also get them on my birthday and one of them whas also directed by Sam Raimi. 1 August: Bluray Metal Pack Edition of ''9' from 2009 http://www.imdb.com/title/tt0472033/, produced by Tim Burton. Anima Volume 3 who include 12 short films and 25 mini films from various country's, show on some Animation festival in Belgium 2005. As I recall, there WAS another TV movie, a ripoff of CARRIE, that had wet t-shirts galore. Had Morgan Fairchild, Robert Stack's kid, a few others, along with Kay Lenz. INITIATION OF SARAH. That might be more in the wheelhouse. I'm talking the one from 1978, not the remake, which I didn't even know existed till I just IMDB'd the title. A few of those ABCs were great. Has anyone sorted out the rights minefield yet, because I'd love to see some of them again. I'd never actually seen it all the way through, and now I've watched it all the way through twice, and watched HOOD blow up at least 20 times. I only dropped the $2.50 after I saw that there weren't any listings for an upcoming blu-ray, but now I know whenever this IS one, I'll definitely re-dip. DVD: The English Patient. Extra's not subtiteld, but the BD release not have any and very bad video quality. Finaly bought the dvd of Thomas Crown Affair 1999. Already own the soundtrack from Bill Conti and the 1968 movie. For 2004 dvd is bit disapointed the bonus material not have any subtitels or atleast in English. It be situtation like the OHMSS Se dvd from 2001 where that one be only SE dvd where the bonus material are not subtitels where the other 18 have English. But i read the Blu-ray release not have bonus material (I expect it have same disc as American release) and upscaled in my Blu-ray player the dvd looks/sound great. It be my 10th none Bond movie in my collection with Pierce Brosnan. I picked up SNAKE EYES and ARTIFICAL INTELLIGENCE, as well as the first season of HANNIBAL (all on Blu). Totally didn't know SNAKE EYES was on Blu now. I picked a Warner Archive DVD of ALL FALL DOWN (1962) and the Criterion Blu of ON THE WATERFRONT, which was on sale for a good price. Worth the purchase. It has a ton of stuff on it. ALL FALL DOWN has got one of my favourite Alex North scores. Close Encounters 30th Anniversary boxset thingy. Blood Diamond. The 2 disc SE dvd never be released in my country, the BD release have same extra's as this 2 disc SE and i have now higher audiotrack. Swordfish. BD video quality be les then dvd and the easter egg extra's are not take over. Resident Evil: Extinction 2 disc Metalpack with with also DTS track. No extra's on the BD release (and in 1080i). Tristan & Isolde 2 disc Steelbook with also DTS track. There be les extra's on BD with moost missing the tv spots and photogallerie. Amelie 2 disc limited Digipack with also DTS track. Biggest letdown on the BD release be missing extra's. DVD/Soundtrack Combopack: Ver van familie (Far From Family). Dutch produced movie. Wanted. The 2 disc SE Steelbook stay for a whyle on my wishlist but since i have BD,i whant the BD release who have same extra's and i don't whant to pay more then i pay for 2 disc SE dvd's of The Incredible Hulk or third Mummy movie from the same year. DVD: Outlaw 2 disc Steelbook with also DTS track. A movie with Sean Bean (Goldeneye). I recently bought the Blu-Ray of Olympus Has Fallen, which I look forward to watching. Jaws 2-4 boxset thingy. On the cheap, just as well because Jaws 2 alone gave me a headache.